Sorry for an old picture. I’ll try to get a better pic over the weekend. I’ve been working exclusively on Tell It To The Stars. 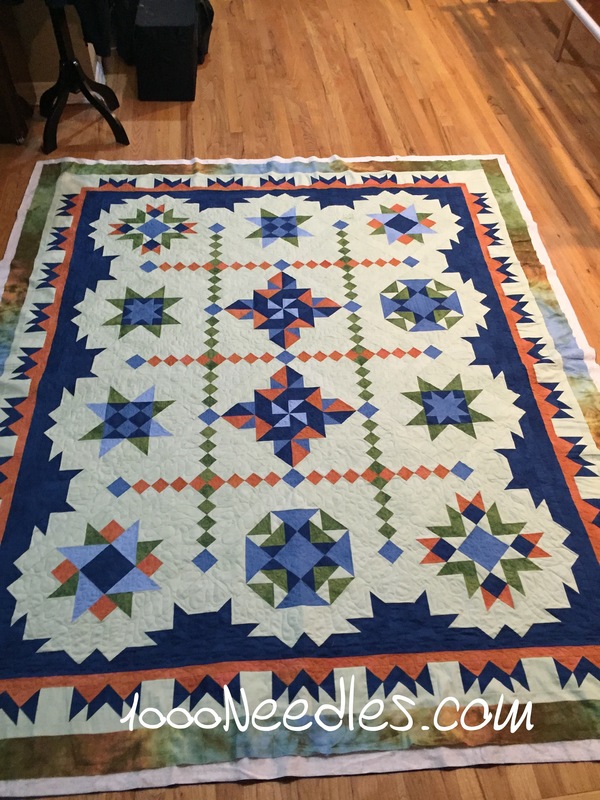 The borders are all quilted. I did it with my Bernina and Aurifil 50w #2326 which is a tan color. I used the same thread on the top and the bobbin and I basically FMQ’d it. I made it a simple meander which I felt worked really well on the border. I took Bailey off the frame and brought him to be serviced. I took him to a shop I’d never been to before but is down the street from my office and on my way home. The lady proprietor was very nice and gave me a lot of info on upcoming events. 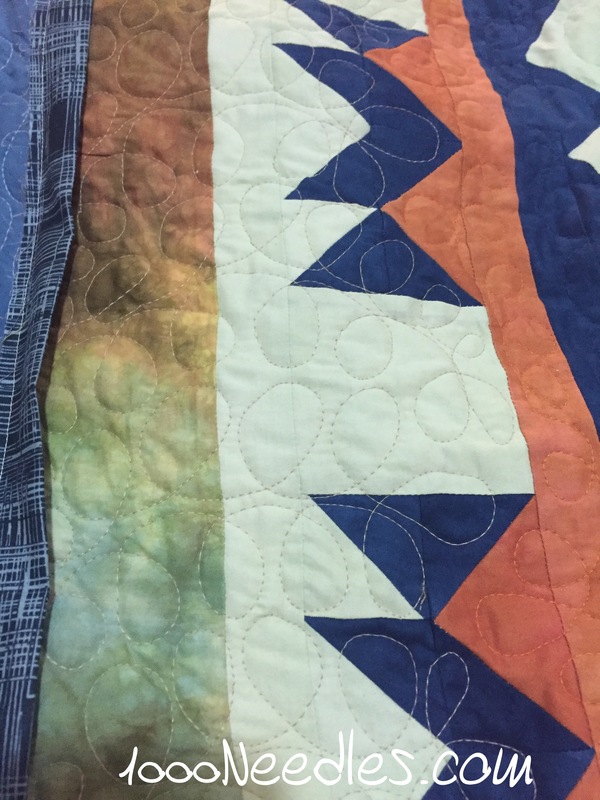 I did have better luck with Bailey once I started using the bottom line thread in the bobbin so I’m hoping that with the service he’ll be up to snuff for the next 2 quilts ready to be quilted. I’m still looking into whether it might be the frame so this weekend I’ll be cleaning it real good and putting a level on it to see if it’s simply uneven. Hopefully that will fix it right up. And that’s it, I’m hoping to get this done this week so I can report the finish on the sunday stash report. And for once be in the black. I haven’t done much knitting this week. I haven’t done much cross stitching. We had friends over for the Super Bowl and that took over the weekend. We always enjoy having our friends over and reconnecting with everyone so I’m not complaining. I just didn’t get as much done as I usually do. 🙂 Most of my crafting happens on the weekends and the weekdays I use the time to go to yoga. Since I didn’t spend as much time as I usually do I’m a bit out of sorts and so my yoga has gotten pushed aside so I can get my quilt therapy in.